Few titles could be a less apt description for the singer delivering the song. What’s more surprising is that after establishing herself as a songwriter in Nashville, her first major single release was written by somebody else. Curly Putman’s song has a few clever turns of phrase, and Parton’s bubbly persona is lurking just beneath the surface, even if it hasn’t quite bubbled up yet. As with most of her pre-RCA work on Monument, she sings in a slightly higher register and the confidence isn’t fully there yet. But the potential is. How young is she here? It’s obvious that she isn’t that confident yet, her eyes and body language say it. But she definitely already had potential. I’ve always enjoyed this song, though it’s not exactly representative of Dolly at her best. Some songs never get old, and “Dumb Blonde” is one of them. I wonder where the idea that blonde = airhead originated? 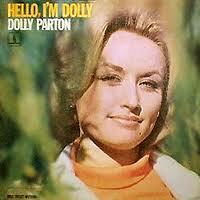 Dolly sang about it 44 years ago, and blonde jokes enjoyed a resurgence in popularity when I was in college.